I read 30 books in 2017 y'all. Much better than 2016 (I think I maybe read 10 including the HP series? Working two jobs did not allow much time for reading) but still not as much as I would have liked. I used to breeze through 10 books a month, if not more. Obviously I now have more responsiblities so there isn't as much 'downtime' in my life but I'd still like to improve and spend more time doing what I love - reading. 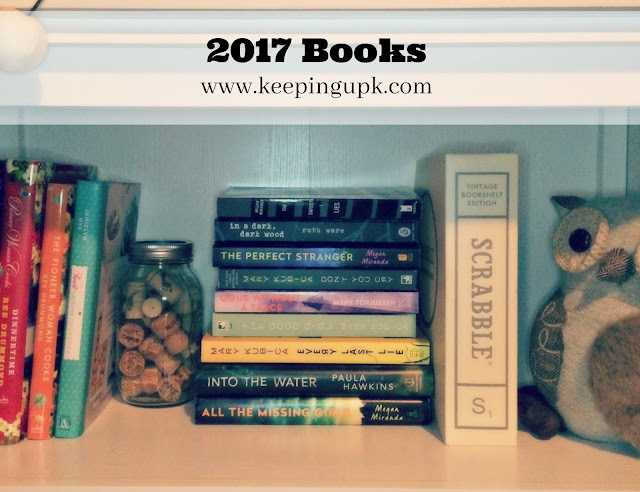 My goal for 2018 is to read 50 books (but hopefully more!). I kept a list of all the books I read in 2017 in the Notes app on my phone. Somewhere around April I thought about doing a monthly round-up but since I had already missed Jan-March I decided that for 2017 I would just do one big round up at the beginning of 2018 and starting in 2018 do a monthly round-up of what I'd read. I now realize this was a flawed plan because there just isn't enough time for me to write my thoughts on each book. So for 2018 I will definitely be aiming for monthly round ups (and linking up with Show Us Your Books!). 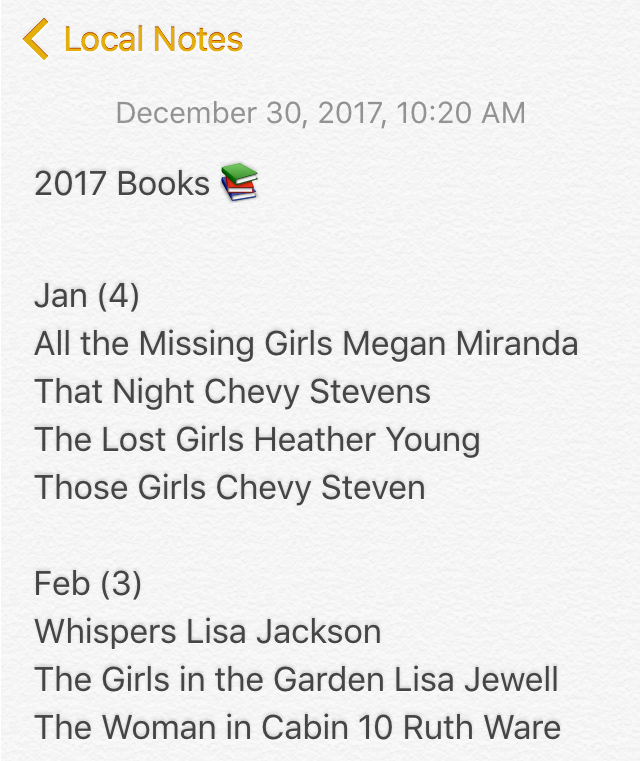 The Perfect Stranger was the second book by Megan Miranda that I read in 2017 and two of her books made my top three. This book grabbed me from the beginning and I read it all in one sitting. Definitely recommend! The Good Girl was the first book I ever read by Mary Kubica and I absolutely loved it. Could.not put it down. I'm usually pretty good at guessing endings but this one completely shocked me. Another book that will never leave my bookshelf. As you can see from my list above, my favourite genres are thrillers and mystery/suspense. I also should note that every summer I do a Harry Potter series reread, so I'm guaranteed to read 7 books every year (and no, I don't think I'll ever stop this tradition). Big Little Lies. I'm not a huge fan of books that involve tons of characters and multiple storylines. I wanted to love this because of all the hype but I just couldn't make myself get through it. Hopefully in 2018 I'll be able to pick it back up and get into it to actually finish. Second Life. This is another book that I wanted to love because I loved Before I Go To Sleep SO much but I just couldn't get into it. Go Set a Watchman. Again, I wanted to love this book (even after all the controversy surrounding it) because To Kill a Mockingbird is one of my favourite books of all time. But I just can't get into it. I've tried restarting it at least three times. Maybe 2018 is finally the year I can get through it? Before I Fall. Y'all. I got halfway through this book before I realized that I'd already read it. In 2010 when it was first released. The movie came out last year so the book was re-released with a new cover for the movie and I thought it was a new book and purchased it again. I was sooo mad at myself when I realized. I didn't end up finishing it once I remembered the ending when I finally realized that I'd already read it. Sharp Objects. I started reading this in November while on the train to Minnesota and I'm about 1/4 of the way through - I just skipped ahead to a different book that I really wanted to read in December so didn't get a chance to finish it in 2017. Gone Girl. My sister gave me this book in 2015. 2015! And I'm still trying to get through it. I will finish it this year. I don't know why I can't get into to! 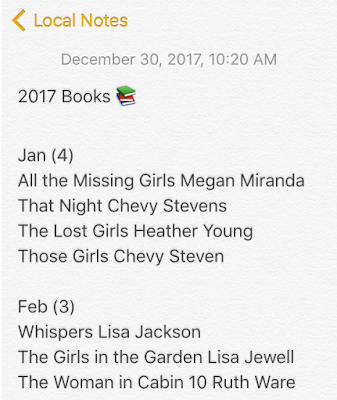 2017 brought Mary Kubica, Megan Miranda, Ruth Ware, and Shari Lapena into my life and now I NEED them to release new books asap so I have something new to read. I am desperate for some new book recommendations so please send them my way! 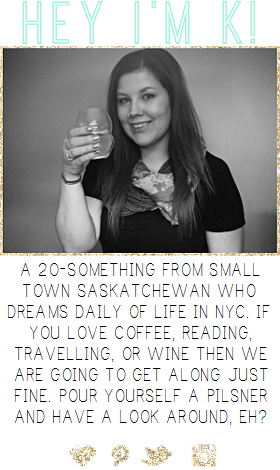 Also, I just finally started using Goodreads so let's be friends! bummer you couldn't get into Big Little Lies, i hope you like it if you give it another go. that is hilarious about before i fall. I cannot stand Ruth Ware's books but I do want to check out Megan Miranda. I give Go Set a Watchman a huge thumbs down. I'm off of Ruth Ware forever but loved both Megan Mirandas that I read. LOLOL sometimes it takes me a while to realize I've read something. I log everything on Goodreads now but read SO MANY BOOKS before I started using that. 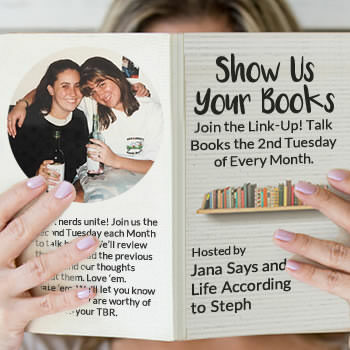 I'm so glad I found your list through Show Us Your Books! I too love thrillers and mysteries, and got some new ideas from you. You've inspired me to read more Megan Miranda and Shari Lapena. Thanks for sharing! It looks like you had great luck with everything you read being 3 stars or above! I haven't read either of the Megan Miranda books yet, but they're definitely on my list to check out. I didn't love Big Little Lies, but the ending was one of the best twists/unexpected moments for me in a book. I really want to read All the Missing Girls, and I loved The Woman in Cabin 10 so I need to read more by Ruth Ware. That's awesome that you reread HP every year. I want to at least read the second and third books again so I can read the illustrated version of them. The first illustrated version is just beautiful. I really love Gillian Flynn; I'm bummed Sharp Objects is going to be on HBO though as I don't have the channel. I'll be reading The Woman in Cabin 10 soon. I've never read anything by the author before, so it will be a completely new experience. 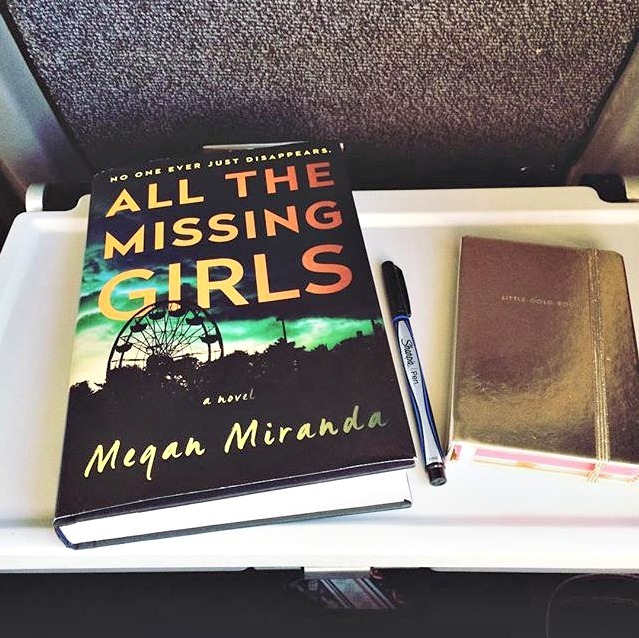 I'm very intrigued by the Megan Miranda book. I may have to check it out soon. PS. Welcome to the SUYB linkup!